Underwater archaeological projects range from the exploration of World War II tanks in the Pacific to 19th-century shipwrecks sunk below the ice of Canada’s Arctic Sea, and from surveys of artificial islands in Polynesian Ponape to inundated springs and caves in Florida and Mexico containing the oldest physical remains of humans in the New World, and to Bronze Age lake dwellings in the Swiss Alps. 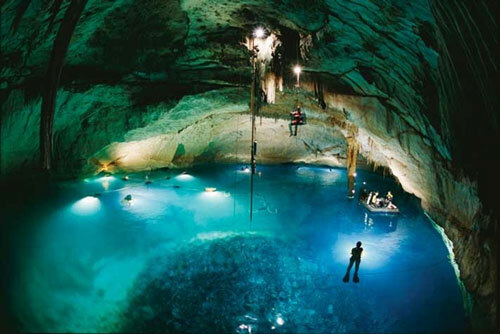 Partially flooded cave in the Yuctan, Mexico. Photo courtesy INAH. Because most of the earth’s surface is covered in water and the underwater world, until recently, has been largely inaccessible, the underwater archaeological repository is vast. H.L. Hunley in slings during recovery operations. 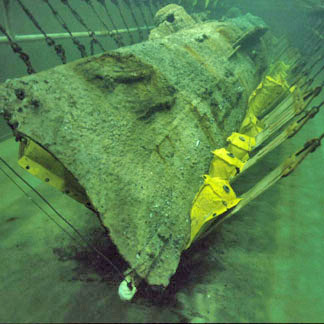 Photo courtesy H.L.Hunley Project. Recent projects in North America includes the confederate submarine H.L. Hunley (1864) in South Carolina; Blackbeard’s ship Queen Anne’s Revenge (1717) in North Carolina; La Salle’s ship La Belle (1686) in Texas; the Emanuel Point shipwrecks (1559) in Florida; a 16th-century Basque whaler and a ship from the ill-fated Phips expedition Elizabeth and Mary (1690) in Canada.In the Caribbean and Latin America there are HMS Swift (1770) wrecked at the southern tip of Argentina, and the search for the Flota de la Nueva España of 1630-31 in the Gulf of Mexico. 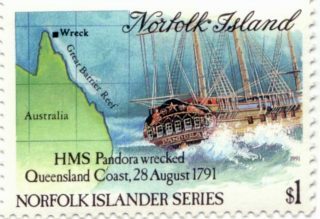 Commemorative stamp of the loss of HMS Pandora, 1791. Elsewhere around the world are the investigations of Pandora (1791) wrecked in Australia, sent to bring Bounty and its crew back from Polynesia; and the Indiaman nau Nossa Senhora dos Martires (1606) and the Angra Bay ships (16th to 19th century) in Portugal. 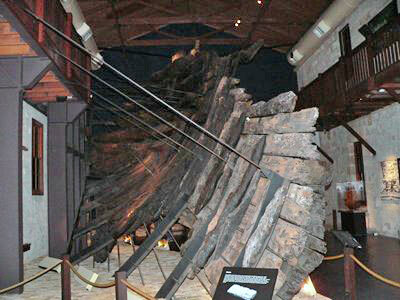 Section of the hull of the VOC ship Batavia on display at the maritime museum. Photo courtesy Western Australia Maritime Museum. Other notable projects are the VOC Amsterdam (1749) and VOC Hollandia (1743) both Dutch East Indiaman wrecked off southern coast of England; the Tudor warship Mary Rose (1545) in Portsmouth, England; the Molasses Reef Wreck (ca 1525) in the Turks & Caicos Islands; the Swedish warships Vasa (1628) and Kronan (1676); sixteenth-century Basque whaling ships (1545) in Labrador, Canada; the VOC Batavia (1629) Australia’s second oldest known shipwreck; and a Bronze Age vessel of the 14th century B.C. off the coast of Turkey. These are only a very few of the many projects undertaken worldwide, which includes shipwrecks in the Great Lakes, Vikings ships in Scandinavia, coastal trading ships in the Gulf of Thailand, the remains of lakeside dwellings in the crannogs in Scottish lochs, and early man sites. Each of these projects is being undertaken by professional archaeologists often working with dedicated volunteers. 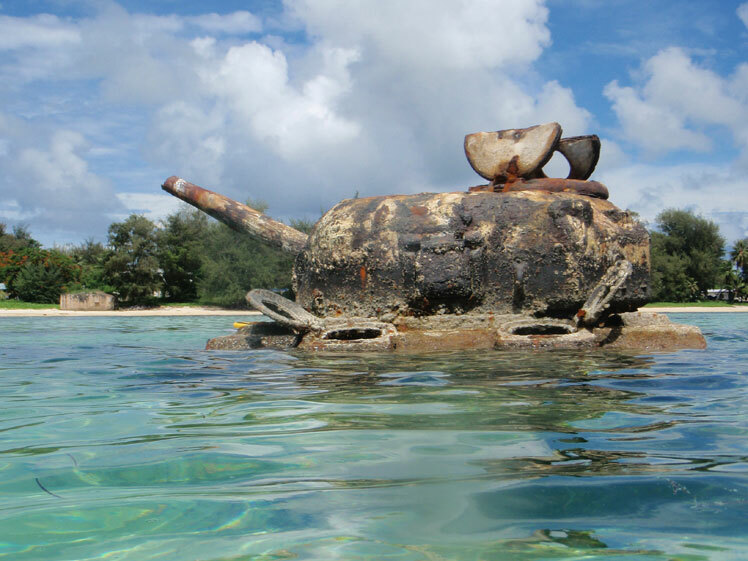 Although spread across the globe and under the direction of many different organizations, the goal of each is similar: to preserve our shared underwater cultural heritage for the future by studying our past.